The Dubai Mall is 10 years young and the world’s most-visited retail and lifestyle destination is marking the milestone with a month-long extravaganza from November 4-28. From luxury fashion showcases to spectacular entertainment, plus a host of incredible prizes to win including three apartments from Emaar Properties, The Dubai Mall 10 Year Celebrations are billed to be the must-attend event of the year. Emaar Malls’ flagship, The Dubai Mall has set the illustrious record of welcoming more than 80 million annual visitors for the past four years – making it the most popular and visited lifestyle destination in the world. Over the past decade, The Dubai Mall has brought tremendous value for the nation, creating over 10,000 jobs and becoming a catalyst for growth for the retail, F&B and leisure sectors. As the preferred retail destination for the 2.5 billion people in the catchment area of just four hours flying distance from the city, The Dubai Mall has been a driver of inbound tourism as Dubai’s most popular attraction, drawing 97 per cent of visitors according to the DTCM Annual Visitor Report 2017. Today, the UAE and Dubai’s reputation as the world’s fourth most popular tourist destination is strengthened by The Dubai Mall’s ability to attract visitors from across the world, notably high net worth individuals from China and Europe, and the wider Middle East, Africa, South Asia and Southeast Asia. Mohamed Alabbar, chairman of Emaar Properties and Board Member of Emaar Malls, said: “The economic impact of The Dubai Mall to the UAE’s economy has been wide-ranging. Transforming not just the retail sector but also creating new referral points in leisure, entertainment and hospitality, the mall has also played a defining role in positioning Dubai as a global fashion capital. 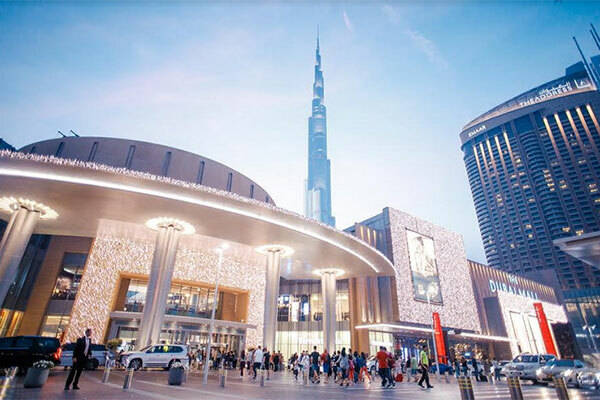 Patrick Bousquet-Chavanne, CEO of Emaar Malls, added: “No mall, anywhere in the world, has contributed so much to a community, as The Dubai Mall has in just ten years. The record annual visitor footfall, robust sales and steadfast appeal as a family leisure destination highlight the industry standards that the mall has set. The Dubai Mall recently expanded its Fashion Avenue, welcoming an additional 150 luxury brands including Middle East flagships and first-time concepts within an exceptional, 5-star setting. Future expansion plans include the Zabeel extension and the Fountain Views retail offer. With over 1,300 retail and food & beverage outlets, many of them brand new or exclusive concepts, The Dubai Mall has become a destination for food lovers. In time for the 10 years celebration a stellar line-up of entertainment choices has been upgraded to include the recently launched Reel Cinemas Platinum Suites, Dolby Cinema, the Region’s first fully immersive MX4D Theatre and Guy Fieri’s Dine-in cinema and Kitchen restaurant concepts. A veritable showcase of events and in-mall activities will mark The Dubai Mall 10 Year Celebrations from November 4-28. • 10 Years of Fashion: More than 40 fashion brands will be holding events and activations during the celebrations. In addition, from November 15-24, The Dubai Mall presents ‘Vogue Loves Fashion Avenue’, a 10-day event inspired by the world’s fashion capitals in an experiential celebration of iconic cities and brands. A partnership between The Dubai Mall and Vogue Arabia, the event will feature four immersive zones in Fashion Avenue where guests can experience dynamic installations, photo moments and ambient programming. Details and dates for the events, talks and activations will be available on www.thedubaimall.com/TDM10 in the coming days. • 10 Years of Shopping: Indulge in the best of retail as shoppers stand the chance to win the ultimate prize, a luxurious new apartment from Emaar Properties. There are three homes up for grabs, with a winner announced every Friday night during the Talisman show, in addition to daily prizes of AED 10,000 in Emaar Gift Cards. Furthermore, surprises await members of the Emaar Malls Rewards Programme during the month. • 10 Years of Giving: Daily wishes and surprises will delight shoppers and fans throughout the 10th Celebrations. In the spirit of giving, The Dubai Mall will launch a ‘Wishing Tower’, which invites visitors to make a wish via social media, for the chance to have them come true. In addition, a roaming Birthday Squad from The Dubai Mall will be surprising visitors with random acts of kindness with paid-for meals and other dining experiences. November’s notable occasions will take on a new dimension on this 10th Anniversary, including Diwali, which will be celebrated with a unique floating art installation called ‘Voyage’ by Aether & Hemera from November 1 to December 2. Enjoyed from the waterfront promenade, guests can interact with this artwork using their mobile phones to change patterns and colours to create a magical, photo-perfect landscape. Live performances by Bollywood dancers will launch Diwali festivities. To mark UAE Flag Day, The Dubai Mall has commissioned a special artwork of the UAE Flag, on display from November 1 -11 near the Grand Atrium. At 180-metre in length, the installation serves as a prominent reminder of the nation’s past, present and future. Finally, United Nations together with Hamdan Bin Mohammed Bin Rashid Al Maktoum International Photography Awards (HIPA) will be hosting an arresting photography exhibition titled ‘People on the Move’ from October 24 – November 20.